Despite The Life of the Mind in America winning the 1966 Pulizer Prize in History, Miller's view of the importance of evangelical religion in the shaping of American culture has not become conventional wisdom. This is not to say that historians have ignored the "Second Great Awakening" to which he was referring or the tremendous social and cultural ferment of which it was so prominent a part. But they have not, with a few important exceptions, carried on Miller's effort to describe the basic categories of thought and styles of imagination through which Americans made sense of their experiences. Instead of seeking a grand synthesis we have specialized. We have gained much knowledge in the process and we have not worried overmuch about how to connect our findings. Miller nonetheless had something very important to contribute to this neglected quest for synthesis. There was, as he expressed it, an "evangelical basis" to the newly emerging national culture. It affected the millions who flocked to revival meetings in the years before 1860, many of whom spoke of their "conversion" as the central moment of their lives. Converts flowed back into already established congregations where they demanded a new style of preaching and prayer. They also formed new sects, splitting established denominations in the process. They joined existing reform organizations, such as those for temperance or anti-slavery, where they often called for a more militant approach. They also formed their own reform societies. Beyond such institutional impacts, they set a cultural tone. They formulated the expectations that defined "respectability." In the process they influenced how "ladies" and "gentlemen" spoke, how they dressed, how they recreated. Evangelicals had an important say in determining which books and authors became well known. It is difficult to exaggerate their overall salience. One way of grasping this is to think about Evangelicalism as a worldview, a coherent way of making sense of experience. At its heart were notions of grace and of sin. Men were sinners. American children still learned at their mother's knee that "In Adam's fall sinned we all." But the revival, the experience of conversion that came with the sincere acknowledgement of one's own sinfulness and the acceptance of God's grace, enabled one to triumph over sin. The notion of triumph over sin is crucial. Evangelicals did not believe, as their Anglican and Puritan forebearers had, that they were saved through grace. They believed that grace transformed them. In the doctrine of Perfectionism, formulated by the great revivalist Charles Grandison Finney, in his Lectures to Professing Christians, and in the Methodist doctrine of Holiness, Christians learned that they could conquer sin. The drunkard could stop drinking. The adulterer could become faithful. The slaveholder could free his slaves. The Christian could stop using the name of the Lord in vain, could observe the Sabbath, could be truthful, could, in short, obey God's commandments. This notion of conquest provided an enormous energy to the converted. They could remake themselves. And, since society was simply a collection of individuals, they could remake it as well. Evangelicals were reformers by definition. Reform meant eradicating sin, the sin of intemperance, the sin of slavery, violations of the Sabbath, prostitution, gaming, and so on. For each sin there were sinners who were responsible for the evil they wrought. Evangelical reformers, therefore, accepted the necessity of confronting the sinner. Often this was a matter of talking with a neighbor and expressing one's concern over the state of his soul. There were tracts that suggested ways in which Christians might most effectively carry out this duty. It also meant directly confronting the rumseller and denouncing the evil he did in trafficking in "Demon Rum." It meant publishing to the world the evils connected with slavery, such as the breaking up of families, the sexual license of the master, the cruel punishments. Evanigelical reform was confrontational on principle. Evangelicals did not have the work of cultural formation to themselves. And they were themselves shaped by other developments such as the rapid impact of technology and industrialization and by the sweep of political developments, especially the ongoing success of the republic. They were shaped by the market as well. The United States of these years was one of the purest expressions of capitalism ever seen. The market called for discipline, frugality, and hard work. It also led to dreams of wealth and extravagance. It held out opportunity for individual advancement but also temptation. Jeffersonian and Jacksonian liberalism and free market capitalism sometimes, as in the emphasis upon individual responsibility, reinforced evangelicalism and sometimes, as in the libertarian restraints upon government interference with individual behavior, conflicted with it. As Miller suggested, a good place to start in making sense of this very complex and enormously important moment in American history and culture is with the Revival. The great figure of the Second Great Awakening was Charles Grandison Finney (pictured at left). Not only was he the most successful and famous preacher, he was the revival's great strategist and theologian. A revival is, Christians agree, an outpouring of God's grace. It was Finney's claim that a minister might nonetheless set about promoting revivals with an even greater expectation of success than an experienced farmer might have of growing a crop. The farmer also relied upon divine favor in that a drought or too much rain might frustrate his efforts. This did not prevent him from studying about seeds, soils, and other practical aspects of his calling. Similarly the minister needed to study human psychology and the Bible. If he did, and if he applied himself wholeheartedly to the task — and Finney claimed that promoting revivals was the minister's sole calling — God would reward his efforts. 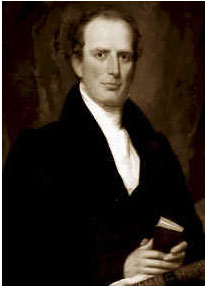 Finney published a "how-to" manual, Lectures on the Revivial of Religion, based upon a series of sermons he preached in New York City in 1835, that became the standard for generations of revivalists. I would say nothing to undervalue, or lead you to undervalue a thorough education for ministers. But I do not call that a thorough education, which they get in our colleges and seminaries. It does not fit them for their work. I appeal to all experience, whether our young men in seminaries are thoroughly educated for the purpose of winning souls. DO THEY DO IT? Everybody knows they do not. Look at the reports of the Home Missionary Society. If I recollect right, in 1830, the number of conversions in connection with the labors of the missionaries of that society did not exceed five to each missionary. I believe the number has increased since, but is still exceedingly small to what it would have been had they been fitted by a right course of training for their work. I do not say this to reproach them, for from my heart I pity them, and I pity the church for being under the necessity of supporting ministers so trained, or none at all. They are the best men the Missionary Society can obtain. I suppose, of course, that I shall be reproached for saying this. But it is too true and too painful to be concealed. Those fathers who have the training of our young ministers are good men, but they are ancient men, men of another age and stamp, [different?] from what is needed in these days of excitement, when the church and world are rising to new thought and action. Those dear fathers will not, I suppose, see this; and will perhaps think hard of me for saying it; but it is the cause of Christ. I had sometimes asked persons in the congregation to stand up; but this I had not frequently done. However, in studying upon the subject, I had often felt the necessity of some measure that would bring sinners to a stand. From my own experience and observation I had found, that with the higher classes especially, the greatest obstacle to be overcome was their fear of being known as anxious inquirers. They were too proud to take any position that would reveal them to others as anxious for their souls. I had found also that something was needed, to make the impression on them that they were expected at once to give up their hearts; something that would call them to act, and act as publicly before the world, as they had in their sins; something that would commit them publicly to the service of Christ. When I had called them simply to stand up in the public congregations I found that this had a very good effect; and so far as it went, it answered the purpose for which it was intended. But after all, I had felt for some time, that something more was necessary to bring them out from among the mass of the ungodly, to a public renunciation of their sinful ways, and a public committal of themselves to God. At Rochester, if I recollect right, I first introduced this measure; This was years after the cry had been raised of new measures. [There] I made a call, I think for the first time, upon all that class of persons whose convictions were so ripe that they were willing to renounce their sins and give themselves to God, to come forward to certain seats which I requested to be vacated, and offer themselves up to God, while we made them subjects of prayer. . . . The minister, Finney pointed out, had to choose this moment of truth carefully. Too soon, and the sinner would not yet be sufficiently convinced of the magnitude of his guilt. Too late, and he would be emotionally drained and unable to act. If the minister chose the right moment, however, first one or two sinners, often well-known in the community for their skepticism or infidelity, would approach the anxious bench. Then a few more would follow, then still more, and then the rest. At moments of such intense emotional fervor the Spirit, Finney argued as had Jonathan Edwards, could physically overpower members of the congregation. Some might faint, some cry out, some fall to the floor. Tears often flowed, tears of joy. Converts testified that they experienced a sudden sense of exultation. Many described it as a feeling of being borne aloft. Others described it as a flood of light completely enveloping them. All said it was the most profound experience of their lives. Converts could not doubt the genuineness of their experience. To those who did doubt they could reply that, were they to be converted themselves, their doubts would disappear. What were born-again Christians to do once the revival ended? Finney exhorted them to join a church, in the first place. A Presbyterian minister himself, Finney did not seek to get them to join his own denomination. Rather they should choose a church with a minister who preached sin and salvation and who would keep their new sense of religious dedication alive. As a result, the Awakening could have unpredictable effects on established congregations. In the best case, and Finney recounts numerous examples, the settled minister had invited the revivalist and cooperated fully in his labors. The new converts then flocked to his church. Sometimes, however, they left other congregations to do so so that, even though the total number of church members increased, individual congregations suffered losses. In still other cases, church members stayed in their original churches but demanded a more forceful and effective style of preaching. This could lead to splits when other members continued to support the pastor. Converts also needed to alter their lives, Finney preached. It had been their old lives which had led them to disregard salvation. Now that they had found it, they had to change those old lives. Again, Finney did not tell them exactly what they should do. They might join a reform organization, he would say. That would be fine, provided they were active members. They might start organizations of their own. The point, he insisted, was that the convert live a new life. The converted were to conquer sin. The drunkard would become sober, the profligate chaste. Moral perfection was attainable, Finney proclaimed.
. . . I once knew an individual who was a slave to the use of tobacco. At length he became convinced that it was a sin for him to use it, and the struggle against it finally drove him to God in such an agony of prayer, that he got the victory at once over the appetite, and never had the least desire for it again. I am not now giving you philosophy, but FACTS. I have heard of individuals over whom a life of sin had given to certain appetites a perfect mastery, but in time of revival they have been subdued into perfect quiescence, and these appetites have ever after been as dead as if they had no body. I suppose the fact is, that the mind may be so occupied and absorbed with greater things, as not to give a thought to the things that would revive the vicious appetite. If a drunkard goes by a grogery, or sees people drinking, and allows his mind to run upon it, the appetite will be awakened. The wise man, therefore, tells him to "Look not upon the wine when it is red." But there is no doubt that any appetite of the body may be subdued, if a sufficient impression is made upon the mind to break it up. Since perfection was within reach, nothing less would do. It was not enough to control public behavior. It was necessary to eradicate sin. This doctrine is known as Perfectionism. "Christian perfection is . . . perfect obedience to the law of God." There is a pertinacious unwillingness in sinners to become Christians, and in Christians to become perfect, or to come up to the full perfection required both by the law and gospel. Sinners may strongly wish to become Christians, and Christians may strongly wish or desire to be rid of all their sins, and may pray for it, even with agony. They may think they are willing to be perfect, but they deceive themselves. They may feel, in regard to their sins taken all together, or in the abstract, as if they are willing to renounce them all. But take them up in the detail, one by one, and there are many sins they are unwilling to give up. They wrestle against sin in general, but cling to it in the detail. I have known cases of this kind where individuals will break down in such a manner that they think they never will sin again; and then perhaps in one hour, something will come up that they are ready to fight for the indulgence, and need to be broken down again and again. Christians actually need to be hunted from one sin after another, in this way, before they are willing to give them up, and after all, are unwilling to give up all sins. When they are truly willing to give up all sin, when they have no will of their own, but merge their own will entirely in the will of God, then their bonds are broken. When they will yield absolutely to God's will, then they are filled with all the fulness of God. After all, the true point of inquiry is this: Have I any right to expect to be perfect in this world? Is there any reason for me to believe that I can be so completely subdued, that my soul shall burn with a steady flame, and I shall love God wholly, up to what the law requires? That it is a real duty, no one can deny. But the great query is, Is it attainable? I answer, Yes, I believe it is. Perfectionism, and its Methodist equivalent, the holiness theology of Phoebe Palmer (see below), contributed to a highly distinctive style of reform. Social problems, from slavery to prostitution to drunkenness, were sins. All could and should be eliminated. The answer to slavery was immediate emancipation. The answer to drunkenness was prohibition. By the 1830s revival converts were seeking to galvanize the "benevolent empire," as the collection of voluntary associations including the American Bible Society, the American Tract Society, and the American Home Mission Society was known. They sometimes blended into established institutions, volunteering to lead Sunday School classes, for example. At other times they proved highly disruptive. Finney converts Arthur and Lewis Tappan, prominent New York merchants, financed an Anti-Slavery Society which funded abolitionist agents along the model of the Home Missionary Society. Many of the early abolition activists, such as Theodore Dwight Weld, were also Finney converts. Their doctrine of "immediate emancipation" was highly controversial, even divisive. Weld had turned to anti-slavery activism while a student at Lane Seminary in Cincinnati. Lane's president was Lyman Beecher, another revivalist but one less impatient with the settled clergy than Finney. He had opposed Finney's revival campaign in Boston and now sought to persuade Weld and some other students to delay their plans to work with the free Black community in Cincinnati. Lane's trustees would not support anything so controversial, he told them. But, if Weld and the others would only give him the opportunity, he would bring the trustees around in a year or so. Weld and his colleagues summarily refused to accommodate prevailing prejudices and marched off to found Oberlin where Finney took up residence as professor of theology and president. The episode nicely illustrates the differences between moderate reformers like Beecher, who sought to strengthen the social order, and zealots like Weld and Finney, who sought to extirpate sin. Advocates of benevolence shared with revival converts the language of sin. This put them at a rhetorical disadvantage when arguing with radicals. It is difficult to make the case for practical considerations and constraints when one's opponent stands upon the principle of no compromise with evil.